Congratulations to Joshua Riback, Adam Zmyslowski, and our collaborators in the Clark and Plaxco groups on having their recent paper, "Commonly used FRET fluorophores promote collapse of an otherwise disordered protein," published in PNAS! Welcome to Hendrik Glauninger and Abigail Schroeter, who are joining our group as new ngraduate students. Congratulations to Dr. Kevin Song for successfully defending his thesis! 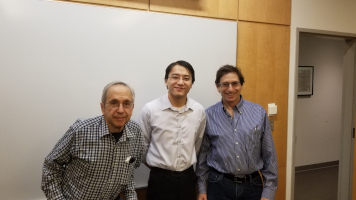 Congratulations to Dr. Zongan Wang for successfully defending his thesis! Congratulations to Josiah Zayner and our collaborators in the Kennis lab on having their recent paper, "Helical Contributions Mediate Light-Activated Conformational Change in the LOV2 Domain of Avena sativa Phototropin 1", published in ACS Omega. Congratulations to John Jumper and Nabil Faruk on having their recent paper, "Trajectory-based training enables protein simulations with accurate folding and Boltzmann ensembles in cpu-hours", published in PLoS Computational Biology. Congratulations to John Jumper and Nabil Faruk on having their recent paper,"Accurate calculation of side chain packing and free energy with applications to protein molecular dynamics", published in PLoS Computational Biology. Congratulations to Zongan Wang, John Jumper and Sheng Wang on having their recent paper published in Biophysical Journal, entitled "A Membrane Burial Potential with H-Bonds and Applications to Curved Membranes and Fast Simulations". Upside has now been applied to membrane proteins! Welcome to Xiangda Peng, who is joining us as a Postdoctoral Scholar! A new paper, "Commonly-used FRET fluorophores promote collapse of an otherwise disordered protein." by Joshua Riback, Adam Zmyslowski, and our collaborators in the Clark and Plaxco groups has been published to biorxiv. Check out the latest contribution to the SAXS-FRET debate! Welcome to David Hynes, who is joining our group as a Summer Researcher. Congratulations to Joshua Riback on successfully defending his doctoral disseration! Congratulations to Joshua Riback for being named the winner of the 2018 APSUO Rosalind Franklin Young Investigator Award by the APS Users Organizations. Congratulations to John Skinner and our collaborators in the Rosner lab on having their paper, entitled "Conserved salt-bridge competition triggered by phosphorylation regulates the protein interactome", published in PNAS. Our work on disordered proteins in solution has been featured on UChicago News, Notre Dame News, and News Medical. Congratulations to Josh Riback, Adam Zmyslowski, John Jumper, and our collaborators in the Clark and Drummond labs. Congratulations to Josh Riback, Adam Zmyslowski, John Jumper, and our collaborators in the Clark lab at the University of Notre Dame and the Drummond lab on having their paper, entitled "Innovative scattering analysis shows hydrophobic disordered proteins are expanded in water," published in Science! Congratulations to alumnus Alex French for receiving a BRAIN Initiative NRSA F32 Individual Postdoctoral Fellowship during his postdoctoral fellowship at Purdue University! Congratulations to John Jumper on publishing his paper "Trajectory-Based Parameterization of a Coarse-Grained Forcefield for High-Throughput Protein Simulation", which is now available on bioRxiv. Congratulations to Josh Riback and our collaborators in the Drummond lab on having their paper, entitled "Stress-Triggered Phase Separation Is an Adaptive, Evolutionarily Tuned Response", published in Cell. Congratulations to Alex French in collaboration with the Rock group on having their PNAS paper, entitled "An Optogenetic Method for Controlling Full-Length Myosin VI through its Cargo Binding Domain", recommended in F1000Prime. 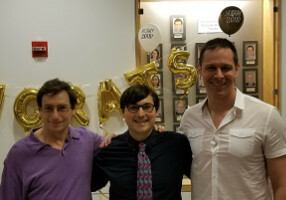 Congratulations to Michael Baxa, Wookyung Yu, Joshua Riback, and our collaborators in the Roux and Kent groups on having their PNAS paper, entitled "Perplexing cooperative folding and stability of a low-sequence complexity, polyproline 2 protein lacking a hydrophobic core", recommended in F1000Prime. Congratulations to Alex French in collaboration with the Rock group on having his paper, entitled "An Optogenetic Method for Controlling Full-Length Myosin VI through its Cargo Binding Domain", published in PNAS. Congratulations to Michael Baxa, Wookyung Yu, Josh Riback, and our collaborators in the Roux and Kent groups on having their paper, entitled "Perplexing cooperative folding and stability of a low-sequence complexity, polyproline 2 protein lacking a hydrophobic core", published in PNAS. Congratulations to Dr. John Jumper on successfully defending his doctoral disseration.